Asus made a rundown of its performance for the year at a global sales presentation yesterday, and set some lofty goals for the next one. 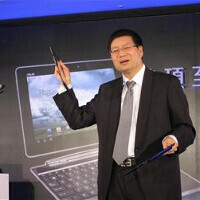 It expects to sell 1.8 million tablets this year, with the volume rising to at least 3 million in 2012. It even went so far as to declare a range of 3-6 million tablets shipped next year, which would place it above Samsung's forecasts for the number of tablets it expects to sell. Granted, with the success of the Eee Pad Transformer, which is one of the best selling Android tablets, and the first quad-core slate the Transformer Prime just about to be launched, not to mention the upcoming Padfone combo, Asus has all the reasons to expect good sales next year. It got shunned from the initial Windows 8 tablets manufacturing team that Microsoft paired recently with chipset makers - Samsung, Lenovo and Toshiba got pollinated with Qualcomm, NVIDIA and Texas Instruments, but there was no mention of Asustek. The Taiwanese, however, said that they are the largest client of NVIDIA in that field and with one of the most advanced R&D departments for mobile computing, so they expect to still play a significant role in the Windows on ARM revolution we are about to experience next year. asus you must be on some kind of drugs to think you can out do samsung. why not? ASUS' main products are Laptops, Computers and tablets while Samsung's main focus are for mobile phones..
your reason sounds so G A Y..
No. Asus can beat samsung the way the eee pad is a lot better than 10.1. It says tablets. Not TVs, phones or anything else. Asus innovates the most and I'm a big fan. It's funny how men´s competitiviness leads to flame wars on all segments. We have iOS vs Android. Inside Android, as we can see above, Asus vs Samsung. Next is Galaxy Nexus vs GSII. And so on... I used to get angry with this discussions too. But one day I had an epiphany and realized how stupid it was to get angry about this stuff. It was funny how I used to tell my girlfriend she should ditch her iphone and get a GSII. She was like: "Okay". Lol. Just like that. Go Asus your products are great! all you need is better marketing! I used to like Asus too. But they support out of USA is abysmal. That´s what kept me from buying the UX31. I had two Asus laptops bought in USA that had problem still in warranty, but their "global warranty" doesn´t cover Brazil. For that I have to take my hat off to Apple. Their support here is very good, as long as your warranty is still valid. Because without warranty fixing those Macbooks is expensive as hell!